Note: This tutorial assumes you know how to write well-formatted XML code. In this tutorial, we’re going to build a visual model of a robot that vaguely looks like R2D2. In later tutorials, you’ll learn how to articulate the model, add in some physical properties, generate neater code with xacro and make it move in Gazebo. But for now, we’re going to focus on getting the visual geometry correct. Before continuing, make sure you have the joint_state_publisher package installed. If you installed urdf_tutorial using apt-get, this should already be the case. If not, please update your installation to include that package (use rosdep to check). All of the robot models mentioned in this tutorial (and the source files) can be found in the urdf_tutorial package. To translate the XML into English, this is a robot with the name myfirst, that contains only one link (a.k.a. part), whose visual component is just a cylinder 0.6 meters long with a 0.2 meter radius. This may seem like a lot of enclosing tags for a simple “hello world” type example, but it will get more complicated, trust me. Note that the roslaunch line above assumes that you are executing it from the urdf_tutorial package directory (ie: the urdf directory is a direct child of the current working directory). If that is not the case, the relative path to 01-myfirst.urdf will not be valid, and you'll receive an error as soon as roslaunch tries to load the urdf to the parameter server. note the single quotes around the argument value. You'll have to change all example roslaunch lines given in these tutorials if you are not running them from the urdf_tutorial package location. The fixed frame is transform frame where the center of the grid is located. Here, it’s a frame defined by our one link, base_link. The visual element (the cylinder) has its origin at the center of its geometry as a default. Hence, half the cylinder is below the grid. The joint is defined in terms of a parent and a child. URDF is ultimately a tree structure with one root link. This means that the leg’s position is dependent on the base_link’s position. Both of the shapes overlap with each other, because they share the same origin. If we want them not to overlap we must define more origins. Let’s start by examining the joint’s origin. It is defined in terms of the parent’s reference frame. So we are -0.22 meters in the y direction (to our left, but to the right relative to the axes) and 0.25 meters in the z direction (up). This means that the origin for the child link will be up and to the right, regardless of the child link’s visual origin tag. Since we didn’t specify a rpy (roll pitch yaw) attribute, the child frame will be default have the same orientation as the parent frame. 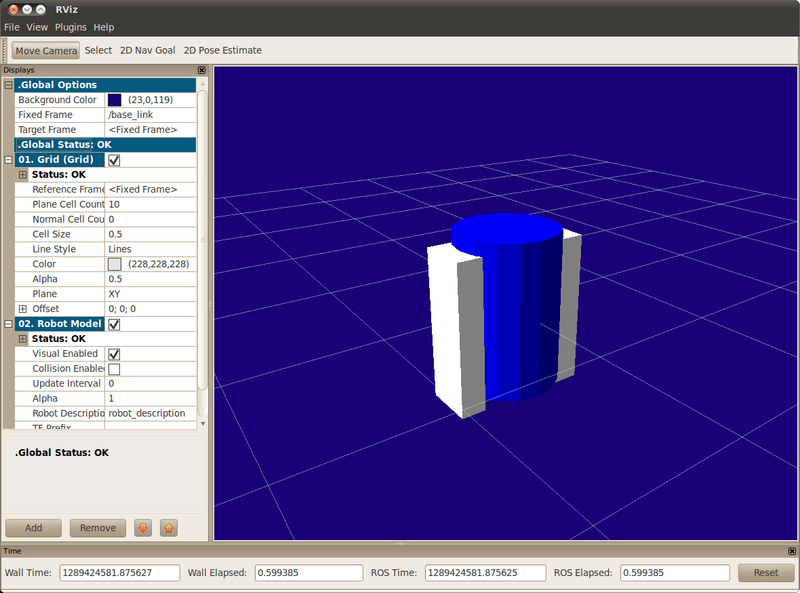 Now, looking at the leg’s visual origin, it has both a xyz and rpy offset. This defines where the center of the visual element should be, relative to its origin. Since we want the leg to attach at the top, we offset the origin down by setting the z offset to be -0.3 meters. And since we want the long part of the leg to be parallel to the z axis, we rotate the visual part PI/2 around the Y axis. The launch file runs packages that will create TF frames for each link in your model based on your URDF. Rviz uses this information to figure out where to display each shape. If a TF frame does not exist for a given URDF link, then it will be placed at the origin in white (ref. related question). You could also define the material tag from within the visual element, and even reference it in other links. No one will even complain if you redefine it though. The meshes here were borrowed from the PR2. They are separate files which you have to specify the path for. You should use the package://NAME_OF_PACKAGE/path notation. The meshes for this tutorial are located within the urdf_tutorial package, in a folder called meshes. The meshes can be imported in a number of different formats. STL is fairly common, but the engine also supports DAE, which can have its own color data, meaning you don’t have to specify the color/material. Often these are in separate files. These meshes reference the .tif files also in the meshes folder. Meshes can also be sized using relative scaling parameters or a bounding box size. We could have also referred to meshes in a completely different package, i.e. 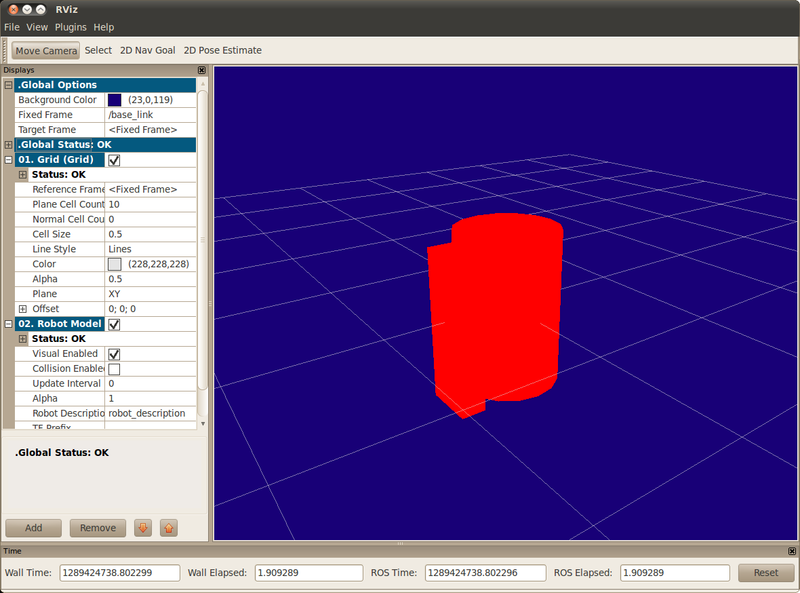 package://pr2_description/meshes/gripper_v0/l_finger.dae which will work if the pr2_description package is installed. There you have it. 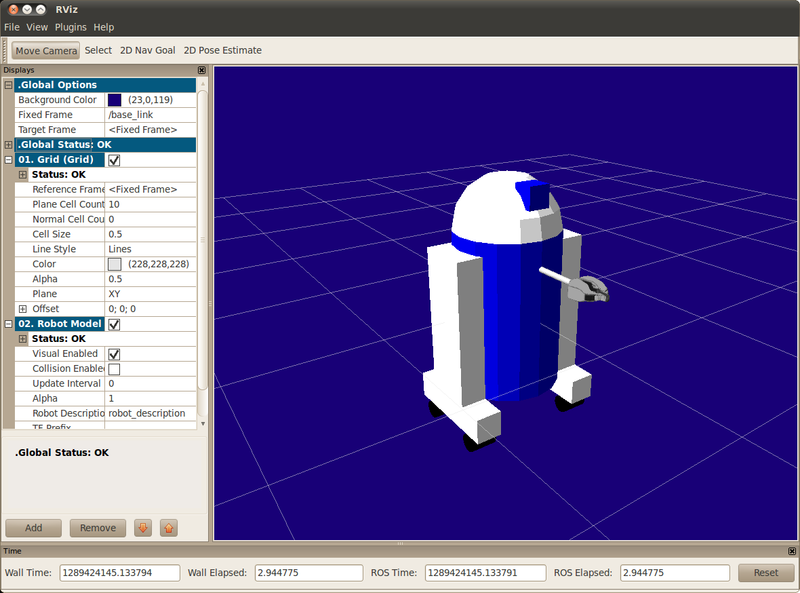 A R2D2-like URDF model. Now you can continue on to the next step, making it move.